From our last post about The Woodhorn Link (click hyperlink to visit), we have drawn an approximation of how we propose to link to Woodhorn. 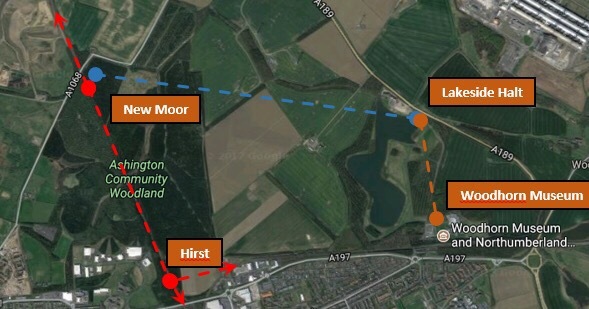 The red dashed line to the left (west) is the presently disused section of the Butterwell Branch, south of the A1068 road, and the brown/orange dashed line to the right (east) is the approximate route of the existing Woodhorn Narrow Gauge (NG) Railway. The dashed blue line to the top (north) is the proposed, new Woodhorn Link, the idea being to connect the narrow and standard gauge lines together via an extension to the Woodhorn line. This would run to our proposed starting site at New Moor (for the standard gauge project) where we intend to create our intial operating base. This link would hold several advantages in our view for many of the stakeholders. Firstly, due to the constraints of the site, a connection would allow car parking to be remote from the site, leaving more space to provide essential infrastructure for operating trains. Secondly, it adds a further destination to the Woodhorn NG Railway, hopefully encouraging greater visitor numbers, and ticket sales, thereby boosting their efforts in the preservation of the former NCB mining locomotives donated to them. Finally, we feel that Woodhorn Museum itself would benefit, with parking being encouraged at their site it would hopefully increase the footfall at the museum. Also, as highlighted in the recent feature in Steam Railway, the railway at Butterwell was once part of the extensive Ashington Coal Company (ACC) network, of which Woodhorn Colliery was also once a part, thus enhancing the historical aspects of the museum. Due to the survival of many authentic items of rolling stock, as well as locomotives; it may well prove possible to recreate an ACC train in the future. Why are we starting at New Moor? This site has been identified by our Committee as the best site to start on this section due to its relatively easy accessibility for heavy road vehicles (required as our trains will likely arrive on site by road), as well as the extra space afforded by the nearby car park and generous space in the former crossing area. It does have the disadvantage that it is quite closely constrained by the woodland, but the plans under development intend to make the best possible use of the limited space available. To recap on our plan; we propose firstly to extend southward towards ‘Hirst’ on the outskirts of Ashington, then, should it prove possible extend again, moving northwards towards Linton, possibly with shared freight use similar to the GCR (N) in the Nottingham area. This would involve crossing the A1068 road, over the presently disused crossing. This extension is heavily dependent upon any planned uses of the branch, as commercial operators take priority over ourselves, but as mentioned shared use may hold mutual advantages which we intend to discuss at a later date. In addition, we hold the longer term aspiration to reconnect at the Ashington end to the rest of the Ashington, Blyth and Tyne, once again making the line a through route. We also plan to enhance the route by building a new chord (curve) connecting the route from north to east pointing in the direction of Woodhorn, this having the advantages of allowing trains to easily reach a new station at Woodhorn, and perhaps beyond? If combined with the proposed Butterwell North Curve, this south curve could be an important route for freight from the former smelter site, which we are willing to accommodate should we build the link, alongside any passenger use (charter trains etc.). To construct this new curve, the field nearest the Hirst station site (also near Rotary Parkway/A197 and Lintonville Terrace) would be of great importance. We are maintaining contact with the owners to see if this proposal would be possible at a future time. 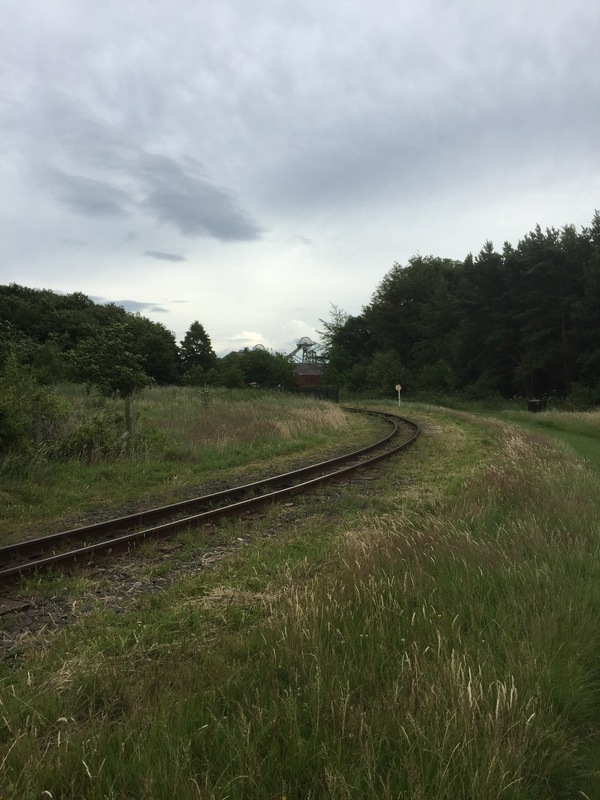 At present we are arranging a meeting with representatives of the Woodhorn NG Railway to further discuss our plans with them, and we will update this blog with our latest progress. In other news, members please don’t forget our AGM on Wednesday 19th July, all information here: ABTRA AGM Notice. Thanks for reading and as ever if you’d like to support us, please do so by joining as a member, a copy of our application forms can be downloaded from the link section on our homepage. Previous The Pegswood ‘Paddy’ & the Woodhorn Link?